The recent news story of two kids (ten and six) walking to and from a park located near a mile from their Maryland home, has me and many other Americans rethinking their parenting. Are we too hands off? Will our kids get kidnaped by strange men in white vans? 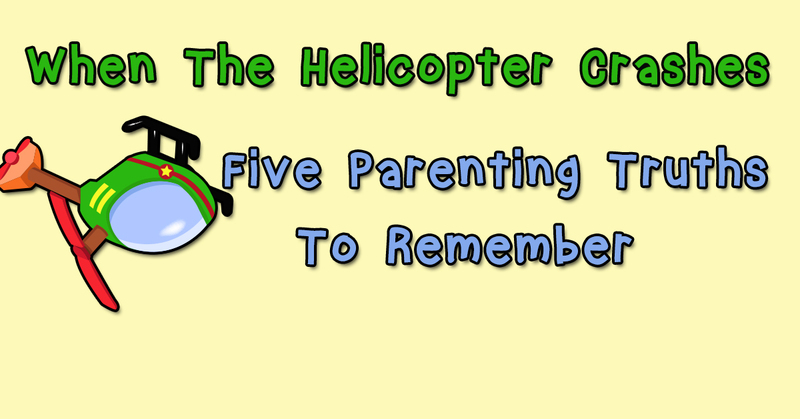 Or are we (like the Meitiv’s think) flying our parenting helicopters too low? And in the process of hovering, are we sucking our kids’ creativity, personality, and social skills right out of their souls? What’s the balance? Will child’s services be knocking on our door soon? Did our parenting helicopter just crash? First, the world is fallen. According to the Bible, nature is groaning with pain (Rom 8:22). It’s inherently broken. Consequently, we will watch our kids will fall out of trees, get stung by bees, and will be scared of tornados. Physical pain and suffering has been transfused into the universe’s DNA. Regardless of how close we hover, our kids will still get sick. We cannot eliminate all pain. Only Christ can do that, and he will. Until that time, we should try to protect our kids from harmful situations and comfort them when they do suffer. Second, our kids are sinners (Ps 51:5). Regardless of how low we fly or of how much scientific room we allow them, kids will make bad and foolish choices from time to time. As a kid, the cost reward analysis always led me (even when offered cash for a clean dental bill of health) to believe that the joy of excessive candy consumption was well worth a few painful cavities. We need to be careful not to provoke our children through our words, and actions. If we give a preschooler Mountain Dew at 9:30 PM and then tell her to go to bed a 10:00 PM, we’ve all but tilled and fertilized the ground for disastrous night. But as we parent our kids, we will encounter all kinds of difficult and unpleasant things. Our kids’ sins don’t necessarily mean we failed as parents or that the Jones’ view of parenting is superior. Third, we are not God (Is. 55:8). We cannot and will not ever be able to perfectly protect our kids or anticipate their every need. We cannot ensure their continual happiness and contentment. We should lovingly and sacrificially care for them. And when struggles come their way, we help them think through things biblically. But God does the rest. He cares for their souls. He provides both us and our kids with all that we need on this earth (Ps 50:10). If God hasn’t given you the money to buy junior an Xbox 360, he may be disappointed, but he is not doomed to a life of crime. Comfort, peace, safety, clothing, and food are all things the ultimately come from above. God will provide. Fourth, God gives us reasonable expectations. Past generations may have believed that failing to give your kids everything they wanted meant you were a neglectful parent. But God doesn’t. He tells us to prepare them for life and to point them to Jesus (Eph. 6:4). With much prayer, we can do this. We can teach them how to manage budget and the importance of obeying God. We can’t keep them from giving into foolish desires or from thinking that standing in swing with no hands is a good idea. But we can point them to the God of all wisdom. Fifth, God gives wisdom. We are not alone! We serve the God of all wisdom. He created parents as a reflection of his character. Since God is the ultimately and perfect parent, he can teach us how to care for children. If we seek him through prayer and scripture, he will gives us the insights we need to loving care for our kids, regardless of their issues. Notice what James says, “If any of you lacks wisdom, let him ask God, who gives generously to all without reproach, and it will be given him” (James 1:5). Regardless of how ridiculous we feel, God will freely give us wisdom when we ask. God doesn’t judge us by the family down the street. Whether you hover or fly a few thousand feet above, we all can parent with hope because we know the creator of the world. We can fly straight to the throne of grace!